The War of Jenkins Ear began between England and Spain in 1739, when the Glasgow brig Rebecca was boarded by a Spanish Man of War. The Spanish captain supposedly cut off one of the ears of the British captain Richard Jenkins and declared "Carry this home to the King your master whom, if he were present, I would serve in a like fashion." 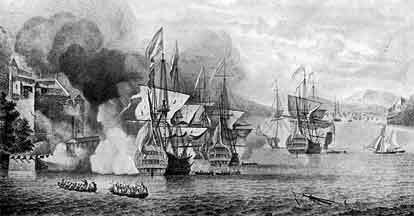 In response Admiral Edward Vernon was sent with a small squadron of six ships to capture Porto Bello, one of the strongest Spanish outposts in the Western Empire. Due to superior tactics and gunnery, he succeeded.